UPDATE - See Stein's comments below for some more accurate naming! 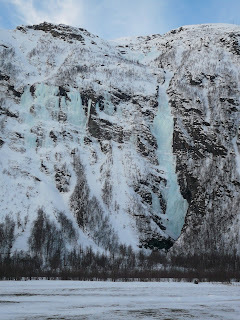 Kåfjordalen, as the main fjord and valley are, are home to a few climbs, including the great atmospheric route Gullyvers Reisen that is buried in the back of a deep cleft in a gulley wall. It is definitely one to do. If coming from Skibotn, as you round the headland and head down the Kafjord fjord, there are two tunnels in quick succession. There is a route above the exit from the last tunnel you will drive through on the way to Kåfjord. There are more further back - easily accessed from the old road used before the tunnel was built. Most likely all in the WI3 range. Boršojohka, the large line on the right, is 240m, WI 3/4. The right hand side of the falls on the left was a full 60m pitch of WI 5. Park at the electricity substation to the north of the routes. Simpletons at Kafjord from Jim on Vimeo. Again, these ignorant Austrians - Kranebitter & Leichtfried. They seem to have taken "Spesiell Canyon" for a name. 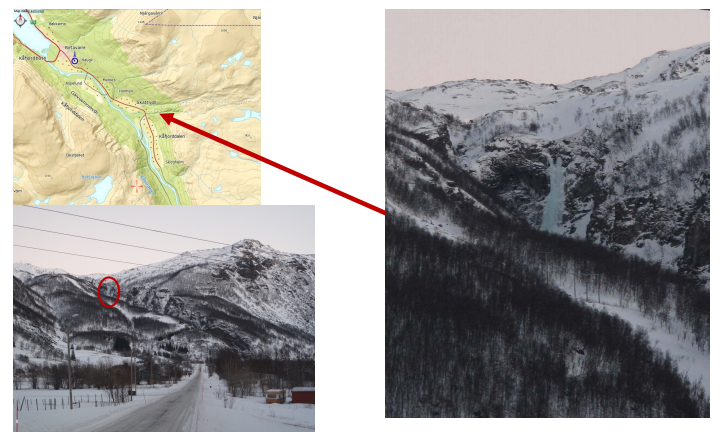 It isn't, it's just the text on a roadsign pointing the way to this unusual canyon (= "spesiell canyon"in Norwegian). The real name is Ørnedalen in Norwegian, while the stream is named Sorbmejohkka in Sami. 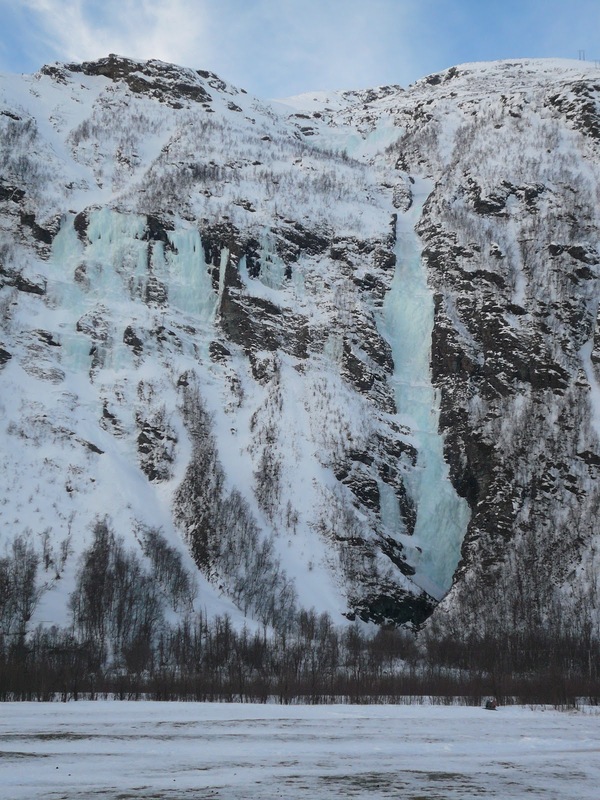 Several waterfalls in the gully were climbed about 15 years before the Austrians went there. 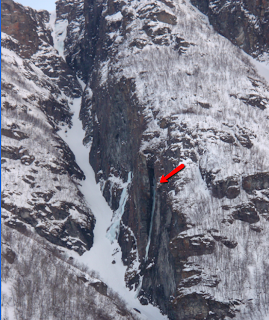 See my comments to their story at http://www.alpinist.com/doc/web10s/newswire-lyngen-norway. 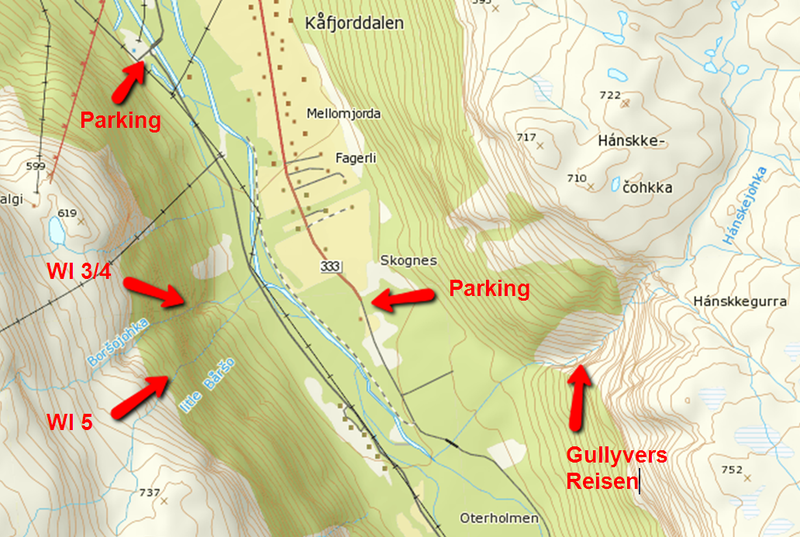 Actually Leichtfied's coordinates 69.400893,20.98177 point to Gorzi canyon (Storfossen), not to Ørnedalen. 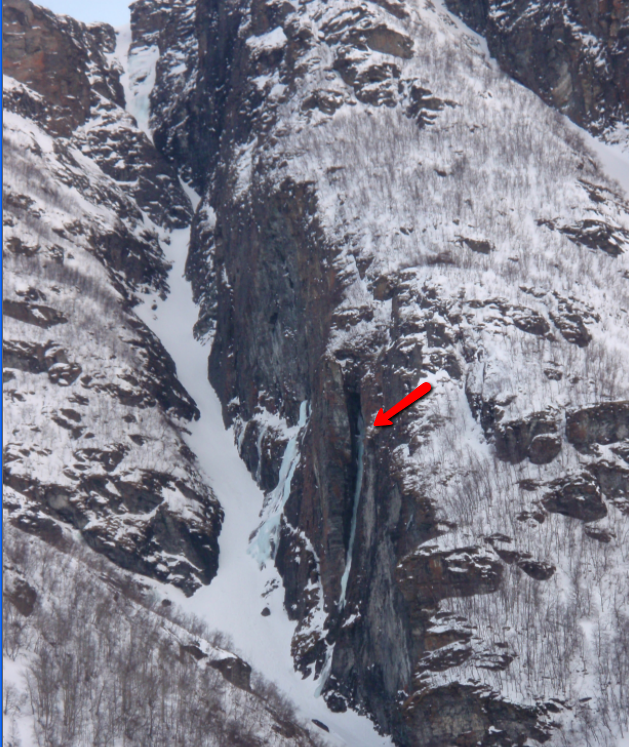 Kurt Astner & co. on the other hand seem to have been Ørnedalen (https://www.blackdiamondequipment.com/en-eur/journal/climb/all/bd-athlete-kurt-astner-establishes-stunning-new-ice-climbs-in-norway-en-eur).